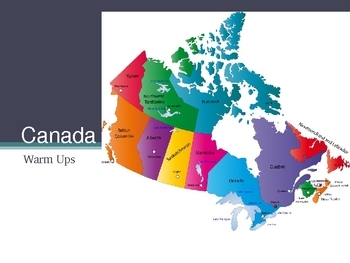 This is a PowerPoint presentation with 38 slides each containing multiple choice questions and maps over Canada. 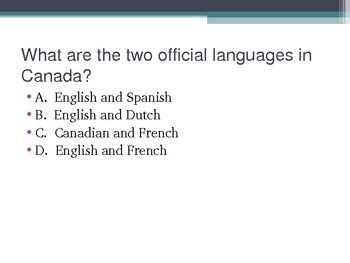 The questions cover Canada's history, government, people/culture, economy, environmental issues,and physical geography. The answers to each question are provided in the notes section on each slide. I use these questions as warm-up activities, but they could be used any way you see fit. The questions are aligned with the standards set by the Georgia Performance Standards, which are almost identical to the Common Core.